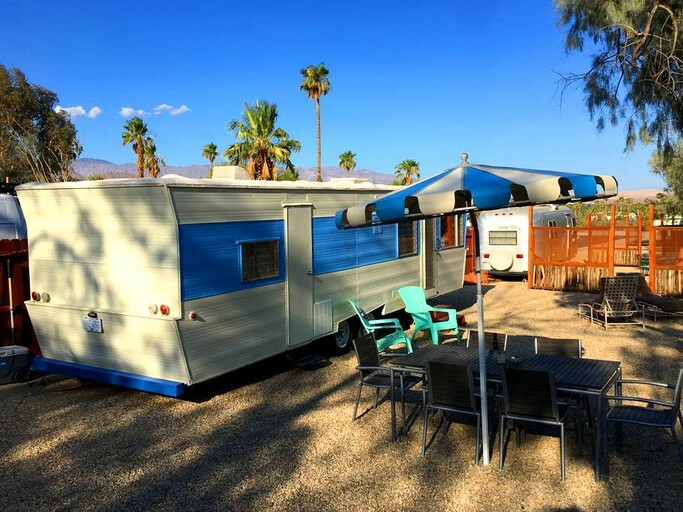 This unique rental near Anza-Borrego Desert State Park, California, can sleep up to four guests. 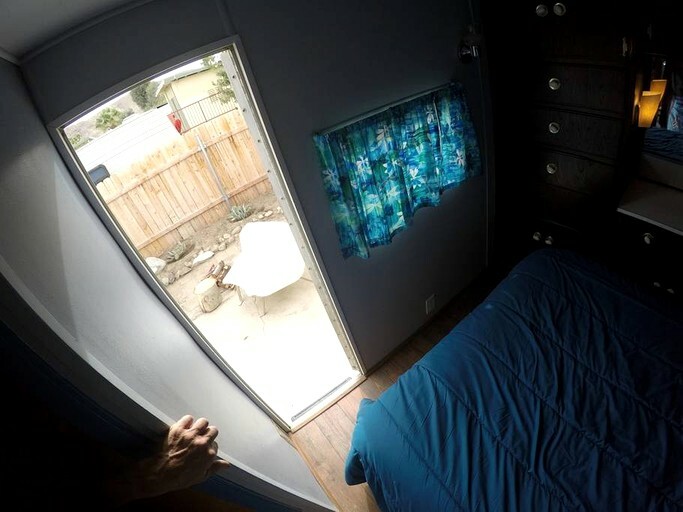 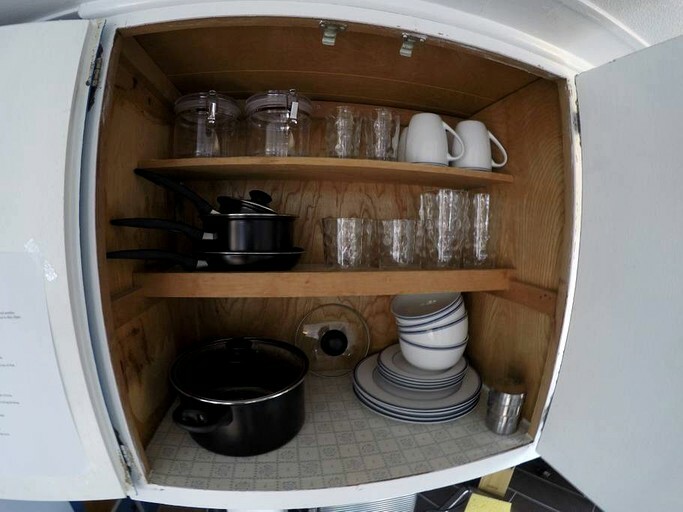 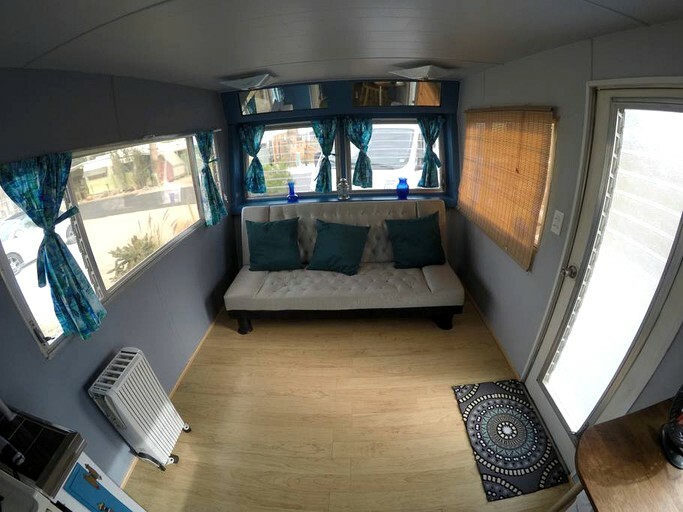 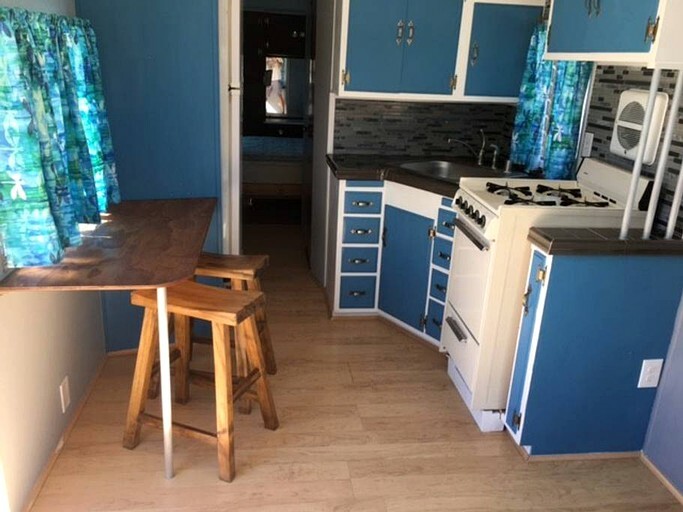 The campervan is an original 1956 Ideal vintage trailer and has been impeccably maintained and restored with new hardwood floors, tiles, paint, and kitchen. 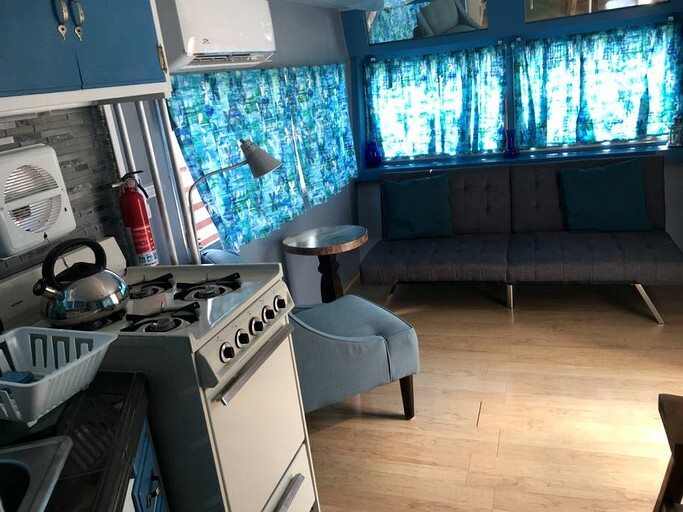 The interior of this vintage camper is adorned in retro-chic furnishings and decorations to offer guests an authentic and unique experience. 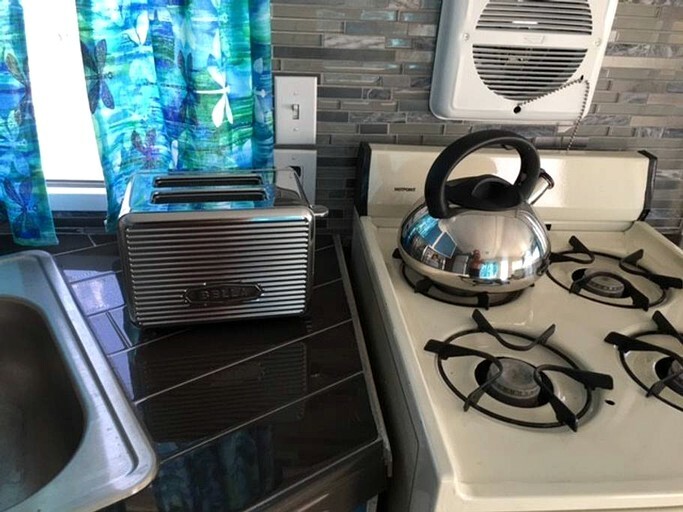 The newly-renovated kitchen has a sleek design and provides guests with all the necessities including a refrigerator, a stove, an oven, a sink, a toaster, and ample cookware. 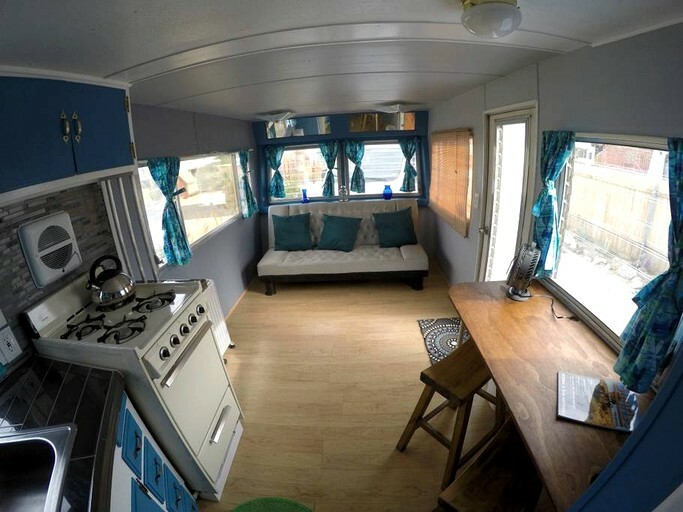 The kitchen also includes a breakfast table for two people, and additional seating can be found outside. 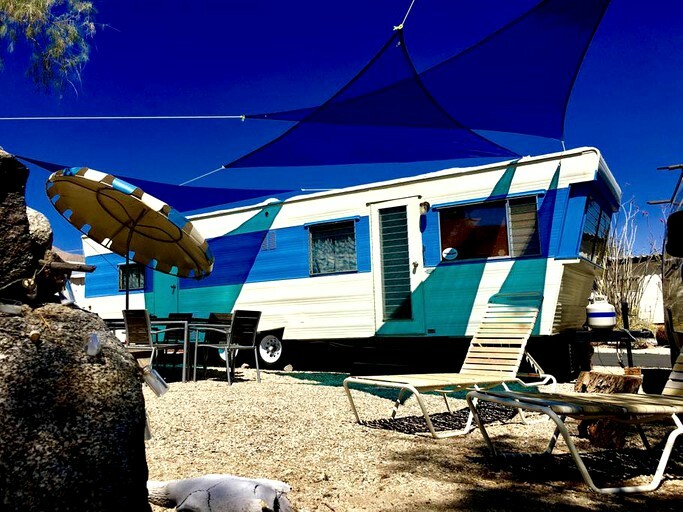 This glamping site is a warm community of vintage RV owners. 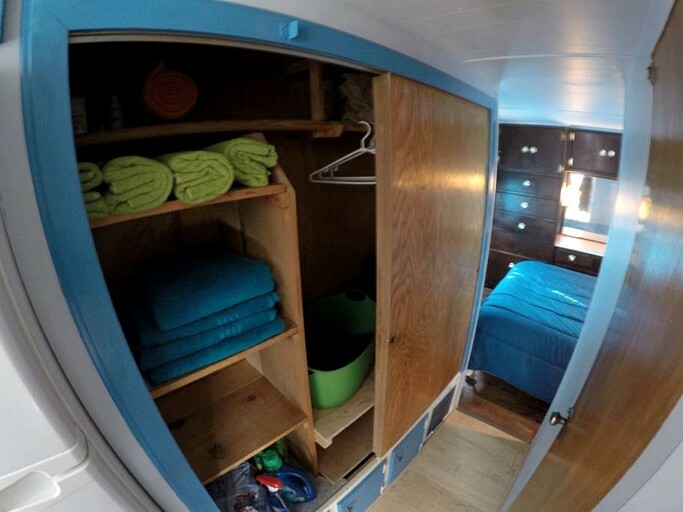 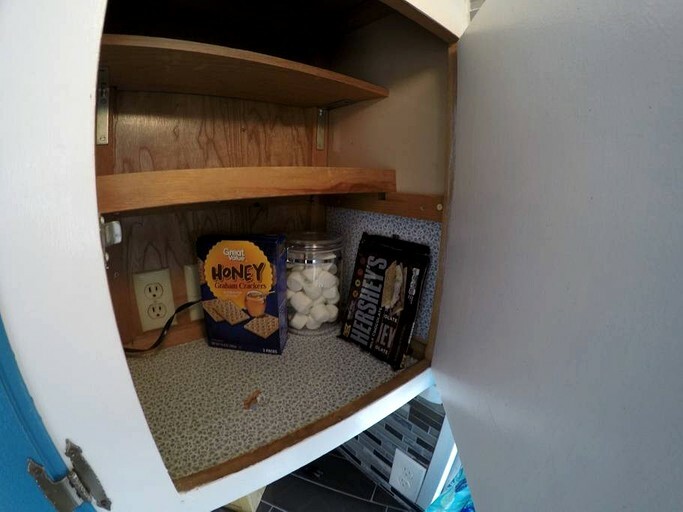 Glampers have access to a laundry room during their stay. 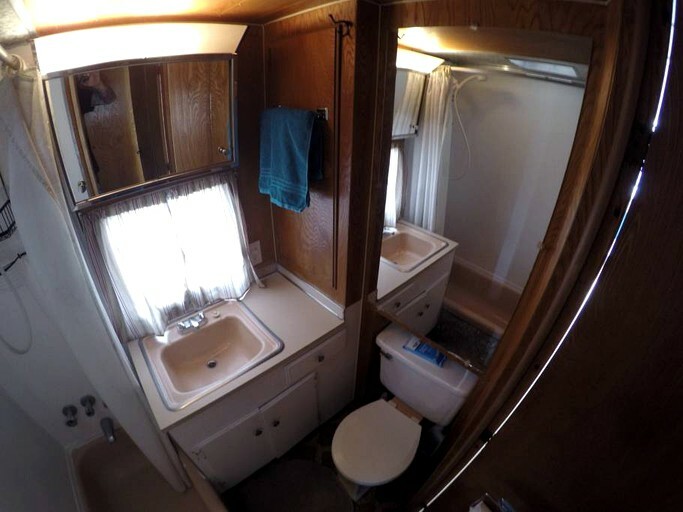 If desired, there are also public showers for rinsing off after a day of exploring. 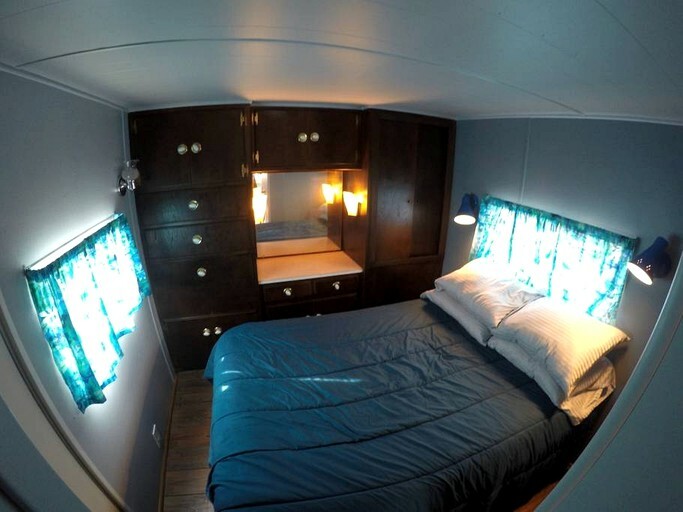 The most popular public destination at the glamping site is the public pool with an attached hot tub. 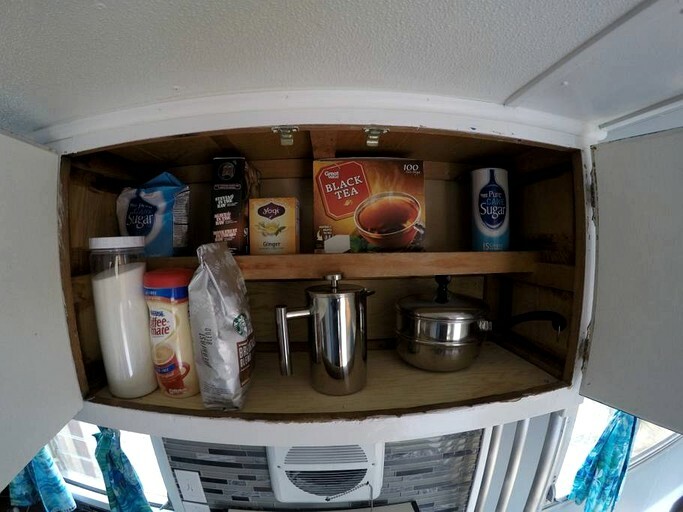 Other amenities include air conditioning, heating, and free parking on the premises. 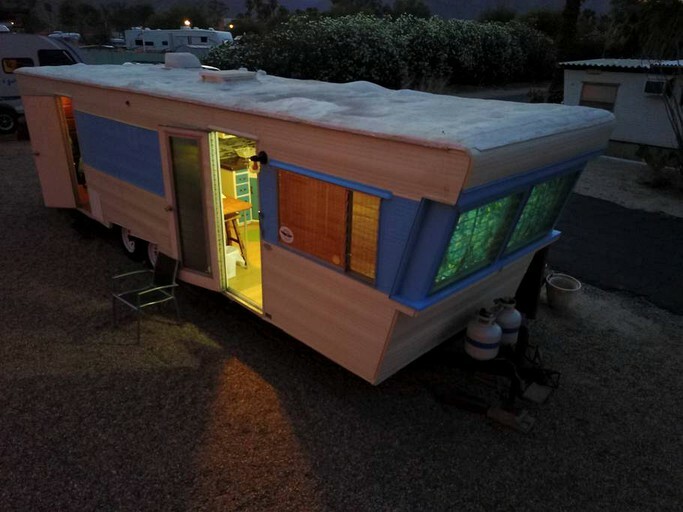 Glampers can relax poolside, jump in the water to stay cool, and enjoy the bubbling hot tub. 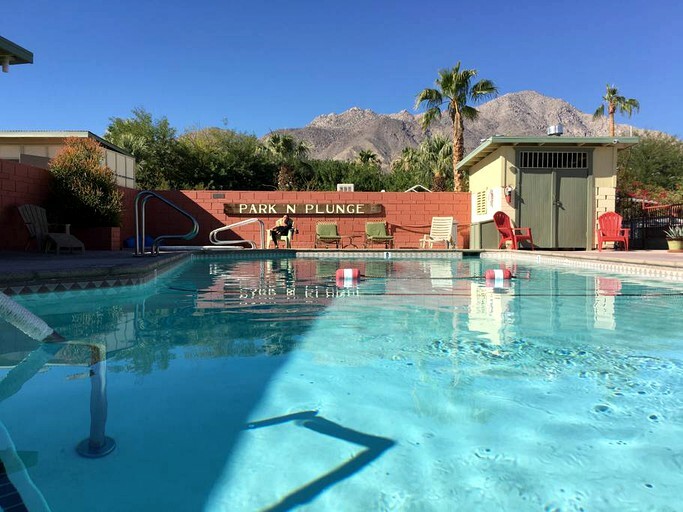 There is a variety of poolside seating arrangements, as well as a grill for cooking out. 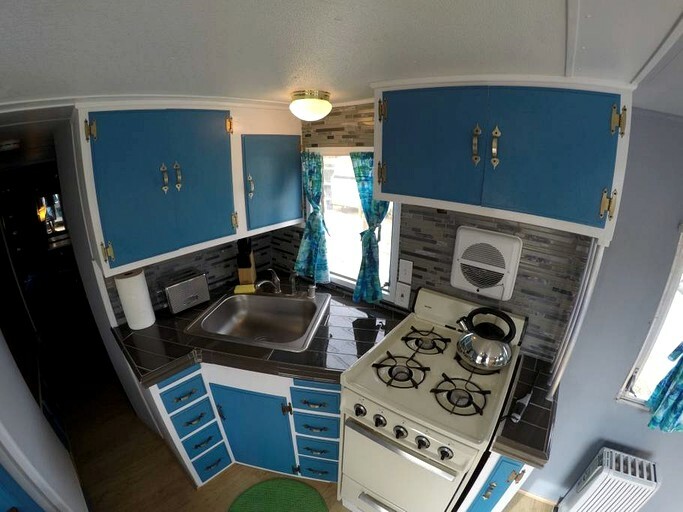 There is also a fully-furnished clubhouse inside a vintage trailer near the pool. 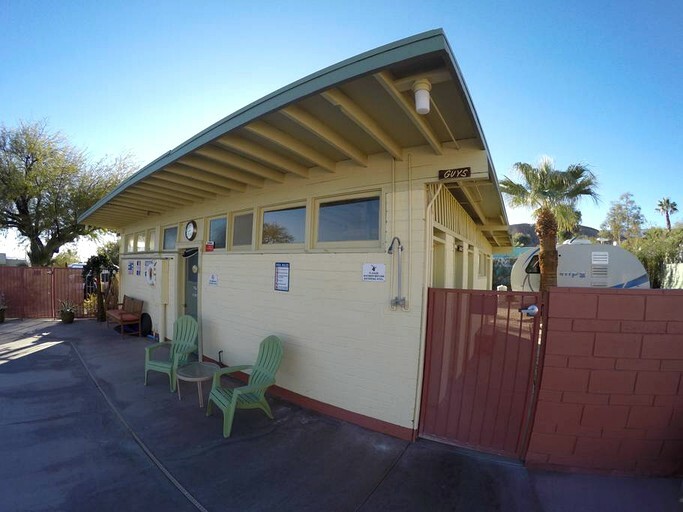 The clubhouse is open from October 1 to May 1 and includes Wi-Fi, a television, a kitchen, and a bathroom. 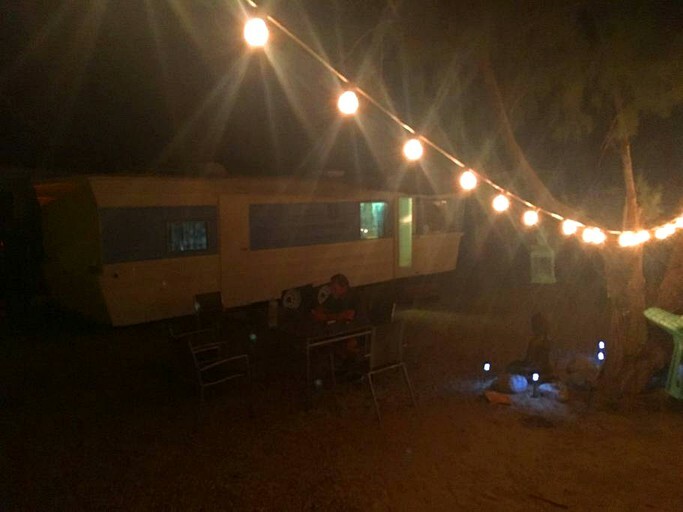 This vintage desert oasis is the perfect location for relaxing and getting away from the hectic world. 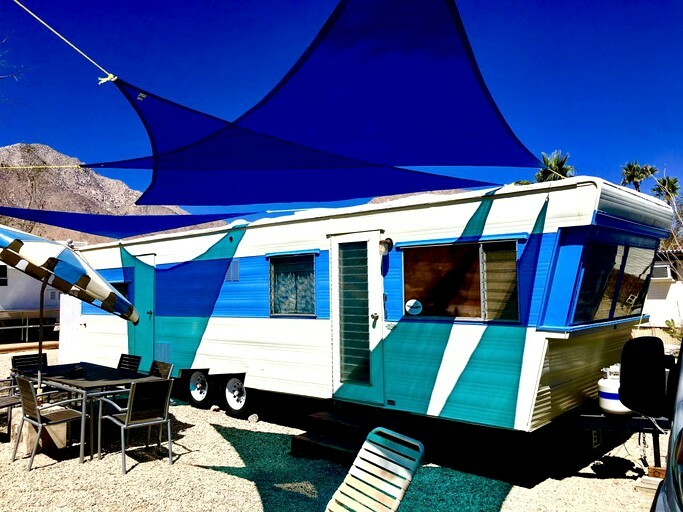 This glamping site is just minutes down the road from California’s largest state park—the Anza-Borrego Desert State Park. 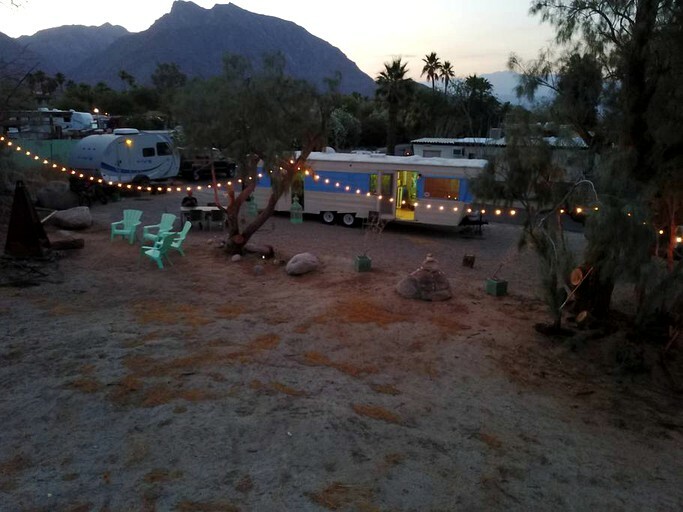 This glamping site is part of a vintage RV park and offers breathtaking mountain views, as well as a small mountain just a short walk from the site. 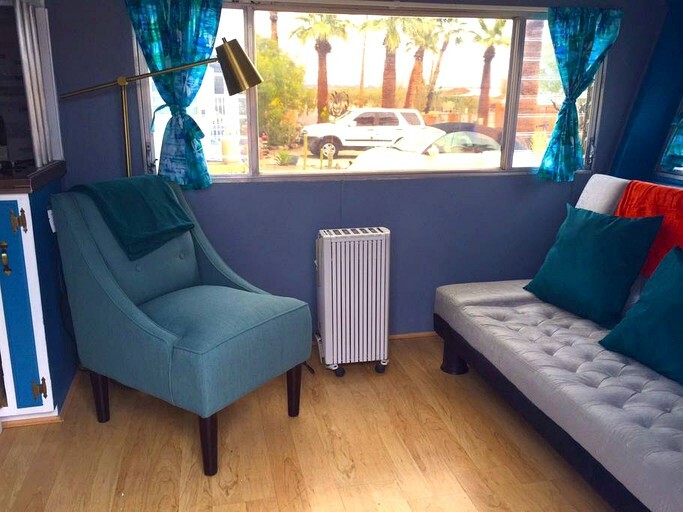 While it may be in the desert, the amenities offered by this location offer glampers the highest levels of comfort. 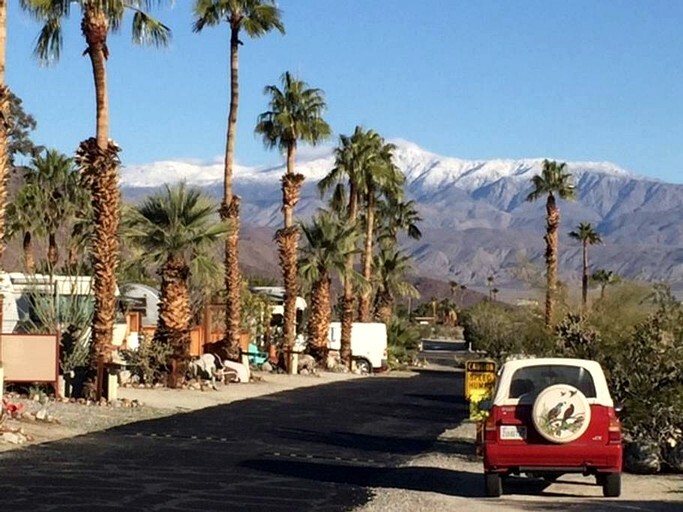 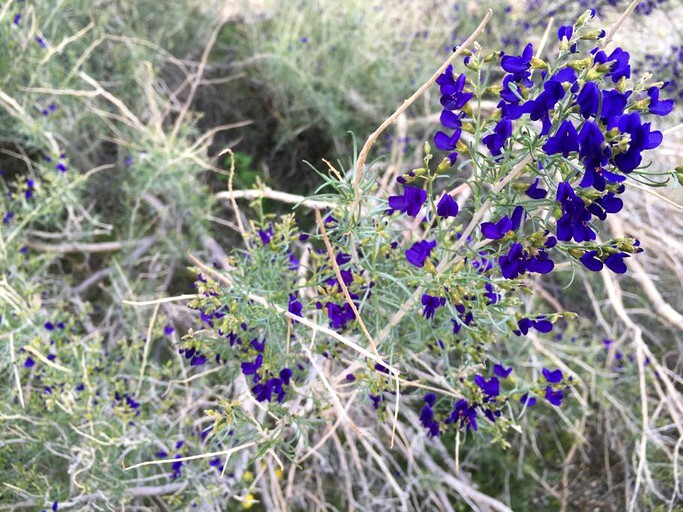 Guests can enjoy some of the best landscaping found in Borrego Springs. 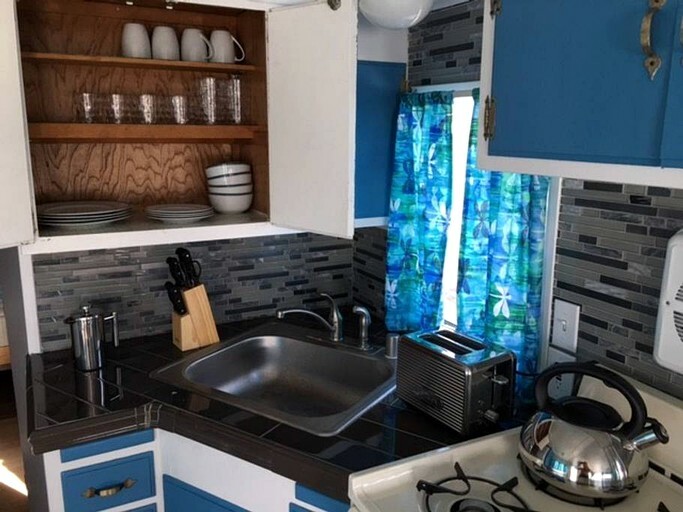 This unique vintage trailer park strives to match the retro vibes of the 50's and 60's travel trailer era, and the result is a laid-back community with relaxing and recreational features. 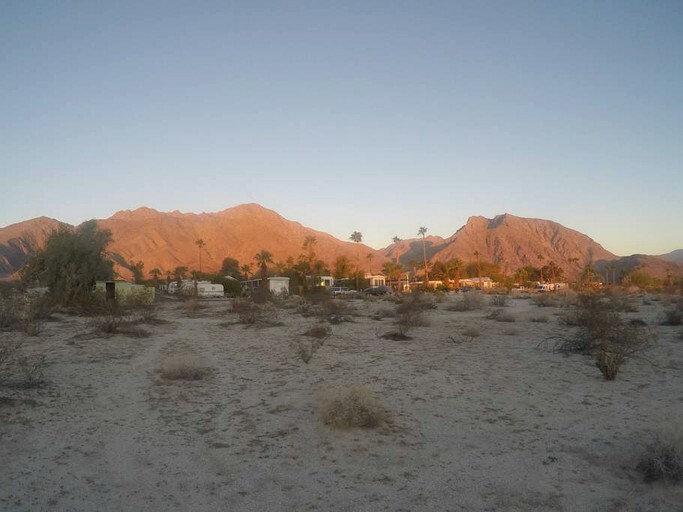 The main attraction in the surrounding area is the Anza-Borrego Desert State Park, just minutes from the glamping site. 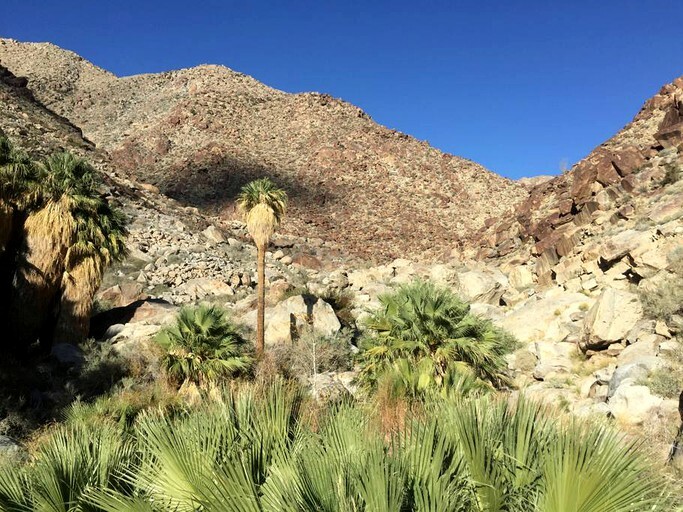 The state park is rich with history ranging from the first inhabitants over 10,000 years ago, to later activity from Native American tribes, as well as the more recent history of settlers passing through during the California gold rush. 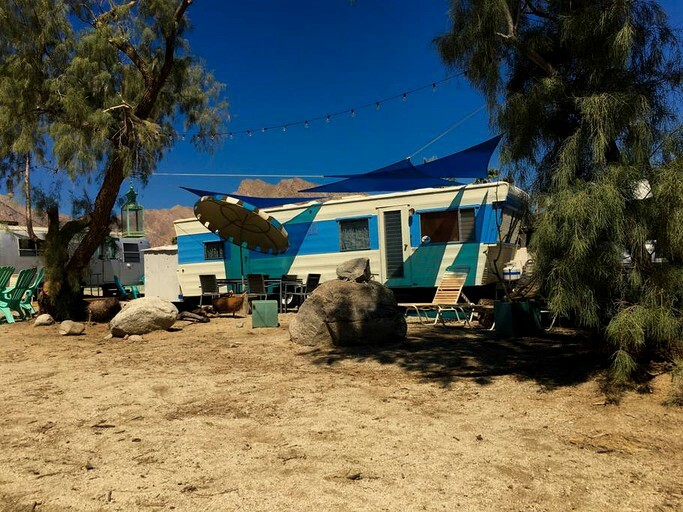 Glampers can expect to see many exciting species of wildlife including roadrunners, golden eagles, iguanas, chuckwallas, kit foxes, mule deer, and the rare desert bighorn sheep. 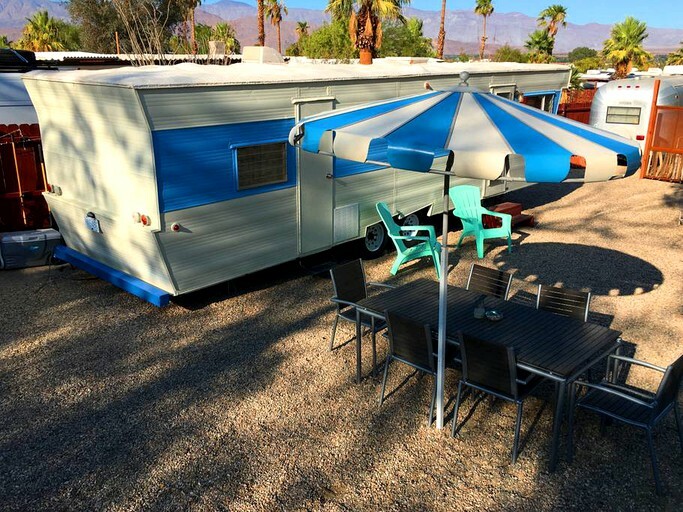 Glampers can enjoy scenic drives through the beautiful mountainous desert park or stop and explore one of the many trail routes, including mountain bike and ATV trails. 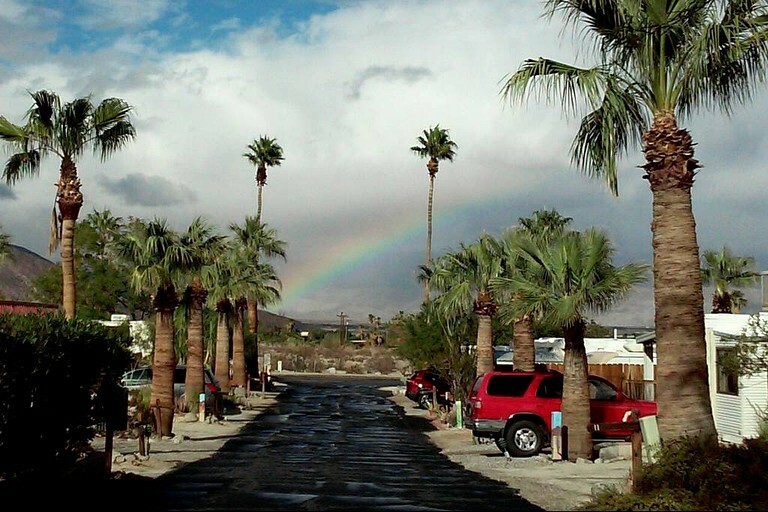 There are also a variety of tours available in town led by experts who are familiar with the rich history and geological features of the surrounding area. 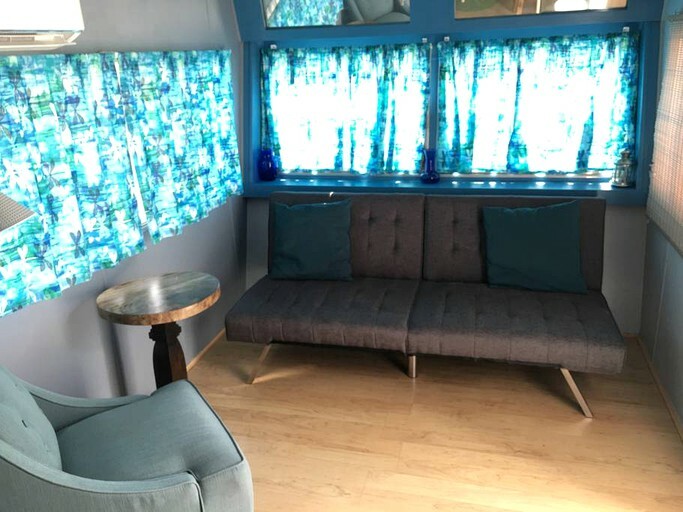 Nature to Glampers may also enjoy a wine tour for a day of delicious food, breathtaking scenery, and tours of multiple wineries. 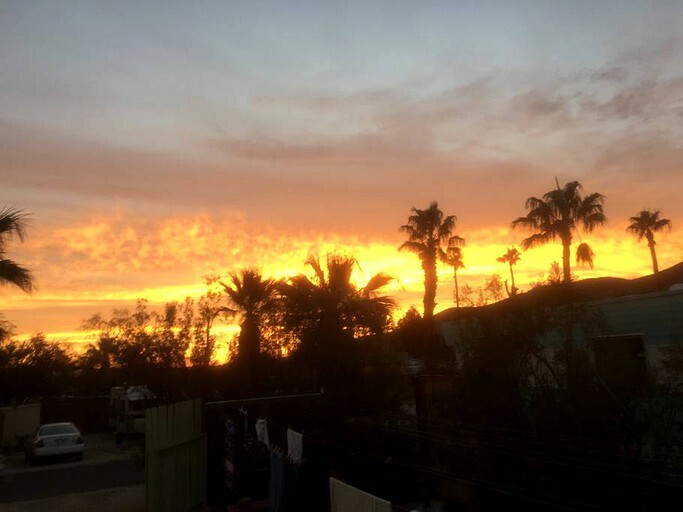 The desert is also home to unmatched stargazing opportunities, ranging from relaxing and observing the stars from home to enjoying the company of a telescope-wielding celestial tour guide. 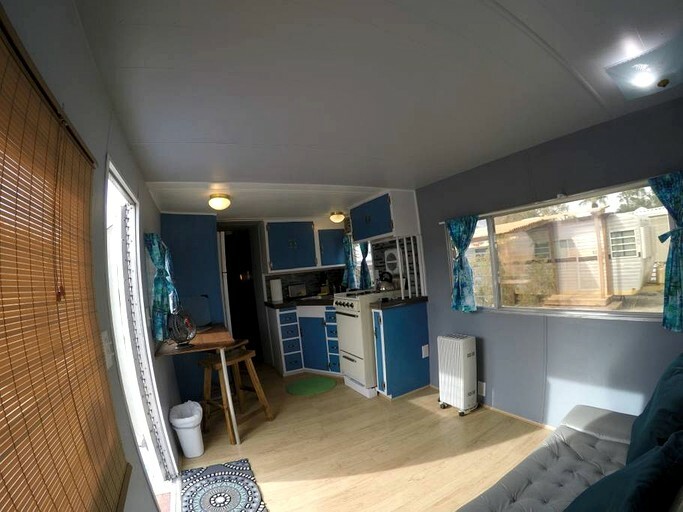 Tennis courts can be found just across the street from the glamping site. 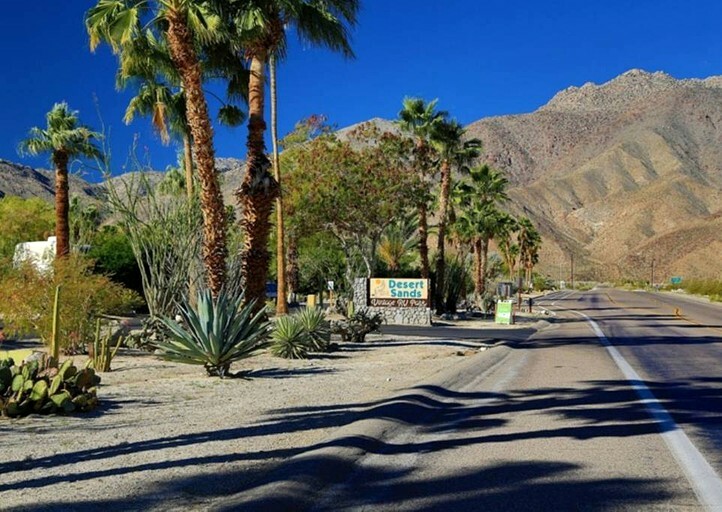 Borrego Springs is also home to six golf courses, bicycle rentals, a local art gallery, horseback riding, and other attractions in town. 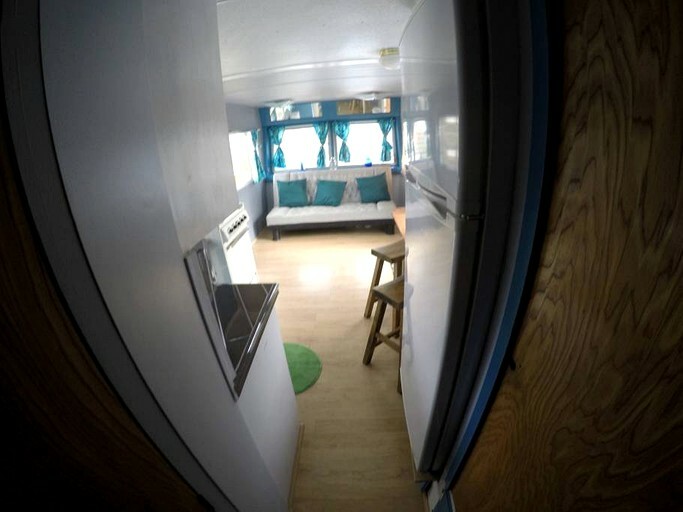 Please note that all bedding, bath, and swim towels are provided, and the kitchen has all the utensils to make meals.